Be the first to share your favorite memory, photo or story of Bernice. This memorial page is dedicated for family, friends and future generations to celebrate the life of their loved one. 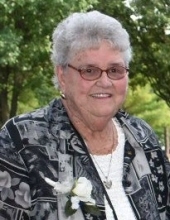 On Friday, March 29, 2019, Bernice Ann Simon, nee Johnson, passed away at Sharon S. Richardson Community Hospice in Sheboygan Falls, at the age of 79. Bernice was born on November 11, 1939 at home on the family farm in the town of Gardner, Door County, Wisconsin to Milton and Sarah (Delorit) Johnson. She was the second oldest of a family of nine children. On August 31, 1957, she married Gerald Robert (Jerry) Simon. They had two sons, Jeffrey and John, and two daughters, Lori and Lisa. Bernice and Jerry moved often in their early married years, settling in 1972 in Kohler, Wisconsin until her recent move to Mapledale Senior Apartments in Sheboygan, Wisconsin. Bernice had a passion for crafting, playing cards and her trips to play bingo but her lifelong commitment to faith, family, and friends longs to be emulated. She is survived by her husband of 61 years, Gerald Simon, her children: Jeffrey (Sara), John (Penny), Lori (Michael) Noonan-Vogl, Lisa (Brent) Gartman, 10 grandchildren: Courtney (Stephen) Post, Tanya (Matthew) Arentsen, Charles (Jaimie) Simon, Emily (John) Cunningham, Aaron Simon, Crystal Simon, Sean (fiancée: Alaina Pfeifer) Noonan, Carissa (fiancée: Kyle Sommer) Gartman, Kaley Noonan, Cody Gartman, 6 great-grandchildren, brothers: Norman (Judy), Raymond (Joanne), Richard (Robin), Joseph (Paula), sister-in-law: Sue Johnson, many nieces and nephews, other relatives and friends. Bernice is preceded in death by her parents, siblings: Janice, Milton, Robert, Rosemarie. A Funeral Mass will be held at noon on Thursday, April 4, 2019 at St. John the Evangelist Church, 600 Green Tree Rd, Kohler, Wisconsin with Fathers Joseph Dominic and Richard Fleischman co-celebrating. The family will receive visitors at the church on Thursday morning from 10:00 AM to Noon. In lieu of flowers, please light a candle(s) at the National Shrine of Our Lady of Good Help in Champion, Wisconsin for the special intention of Bernice. https://www.shrineofourladyofgoodhelp.com/prayer-and-novenas/. Bernice made a pilgrimage to this chapel yearly in August ever since her grandparents took her there when she was five years old. The Shrine of Our Lady of Good Help is Marian shrine is located on the site of an approved apparition of the Blessed Virgin Mary; it is known to be a haven for healing and celebration. To send flowers or a remembrance gift to the family of Bernice A, Simon, please visit our Tribute Store. "Email Address" would like to share the life celebration of Bernice A, Simon. Click on the "link" to go to share a favorite memory or leave a condolence message for the family.